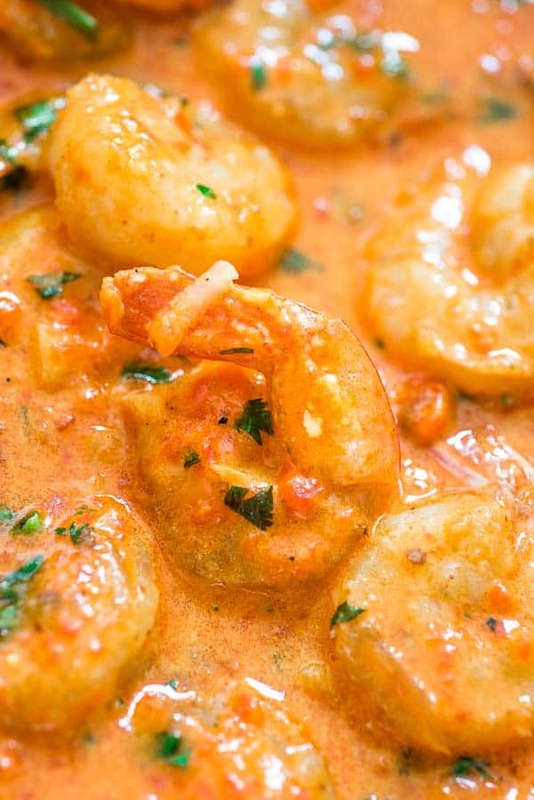 This Shrimp in Roasted Pepper Sauce is lip-smacking good! Roasted bell pepper paired with cream and Parmesan cheese create a unique and delicious sauce. This recipe is my favorite way to eat shrimp. All of the ingredients pair perfectly together, and the sauce is so rich and flavorful. This Shrimp with Roasted Pepper Sauce could be enjoyed with pasta, over rice, or just as is. Dip a slice of fresh and crunchy bread in the sauce. 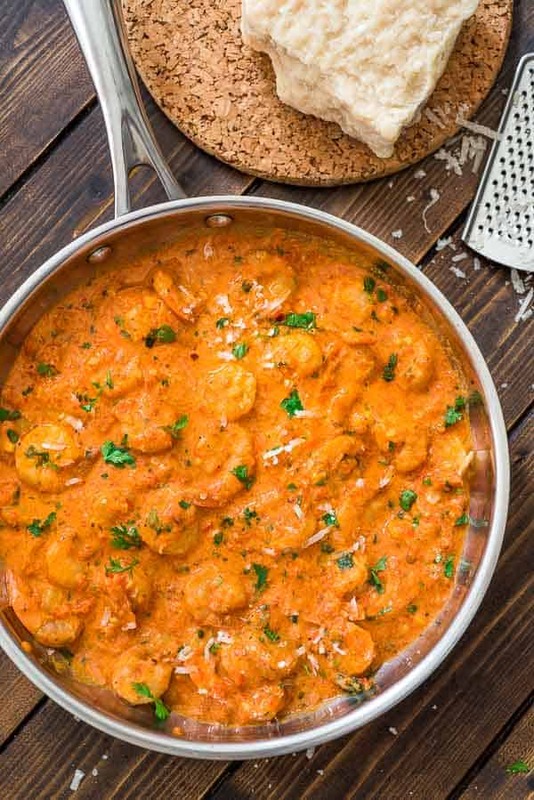 This Shrimp in Roasted Pepper Sauce is lip smacking good! Sweet roasted bell pepper paired with cream and Parmesan cheese create a very unique and delicious sauce. Place the roasted peppers together with the liquid from the jar into a blender or smoothie cup and process until smooth. In a large skillet, melt the butter over medium-high heat. Add the shrimps, paprika, and red pepper flakes. Cook for about 5 minutes. Turn the heat to low and add garlic and salt. Cook for 1 minute and remove the shrimps from the skillet. To the same skillet, add the roasted pepper puree. Turn the heat to medium and cook it for about 7-10 minutes, until most of the liquid evaporates. Add the Half & Half and Parmesan. Stir and bring to a gentle simmer. Return the shrimps to the skillet. Mix everything well and cook for 1-2 minutes, just to heat the shrimp back up. Garnish with chopped parsley and Parmesan.